Glistening snow-capped mountains, sparkling blue lakes and golden tussock grasslands. 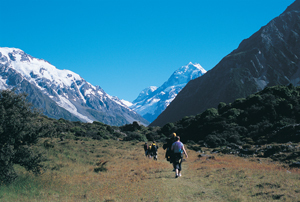 The vast, majestic landscape of the Mackenzie area including Aoraki / Mount Cook National Park is home to some of New Zealand’s most unique and memorable visitor experiences. 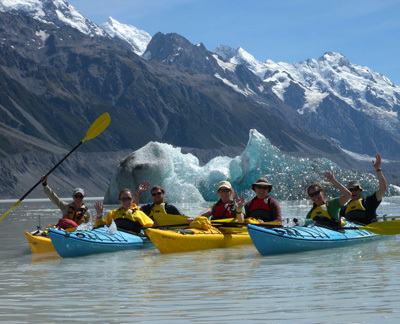 With the peak of Aoraki dominating the landscape at a towering 3724m, the activities on offer in this alpine resort area are as varied as the visitors who enjoy it year round. Whatever your choice, from active pursuits to relaxation and indulgence, you’ll enjoy all whilst soaking up some of the most stunning and famous scenery on the planet. Aoraki Mt Cook Village is just 12km from the summit of Aoraki, and offers a wide range of facilities, accommodation and activities. New Zealand's highest peak, Aoraki Mount Cook can be seen 1 out of 3 days a year. Check the view and conditions from Glentanner Park Centre’s live web-cam, just 24 km from Mt Cook Village. Sir Edmund Hillary Centre – a fascinating tribute to one of the world’s greatest mountaineers and explorers - inside the internationally acclaimed Hermitage Hotel in the heart of Aoraki/Mt Cook village. From an intrepid journey through glacial valleys to a mouth-watering culinary dining adventure, The Hermitage Hotel is the perfect place to base your adventure and discover why Aoraki Mount Cook National Park has endeared itself to adventure seekers for so long.